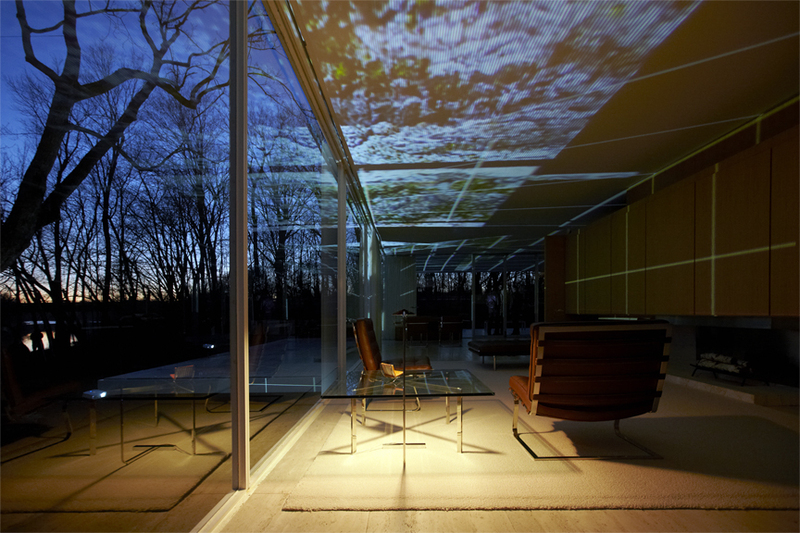 From October 17-20, 2014 the critically-acclaimed artist duo of Petra Bachmaier and Sean Gallero, known as Luftwerk, will bring INsite, a temporary public art exhibition, to Farnsworth House, a site of the National Trust for Historic Preservation. INsite will illuminate the modernist structure with 10 video projections that display a cohesive, fluid video composition and feature original music by Chicago-based percussionist Owen Clayton Condon. With this October exhibit in Plano, Illinois, INsite’s site-specific video and sound installation will complement the structural minimalism and transparency of Farnsworth House. The exhibition will be curated by Steve Dietz, Artistic Director of Northern Lights.mn. Tickets for INsite go on sale August 1, 2014. To purchase tickets, please visit the Farnsworth website at: www.farnsworthhouse.org. Luftwerk is the collaborative vision of Petra Bachmaier and Sean Gallero whose new media installations merge video and light with material, surface, and structure, shaping content into an immersive sculptural experience. Their work illuminates the realm of special events, live performance, gallery and public venue, in locations as diverse as MASS MoCA, JFK Airport, Emirates Palace, Frank Lloyd Wright’s Fallingwater and Robie House. INsite is made possible by a successful Kickstarter campaign, support from Northern Lights.mn through an award from the National Endowment for the Arts, and NEC Display Solutions.